Place a large pot on the stove. On a large cutting board, chop the onion; push to one side. Wash the potatoes (no need to peel). 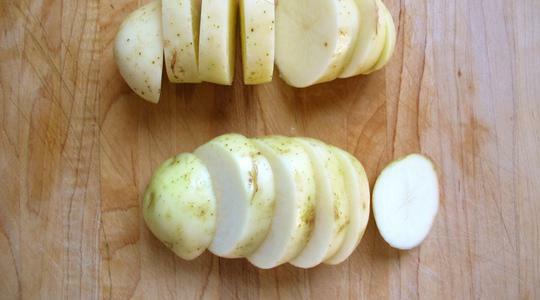 To cut the potatoes into pieces, first slice them into ½-inch thick rounds. 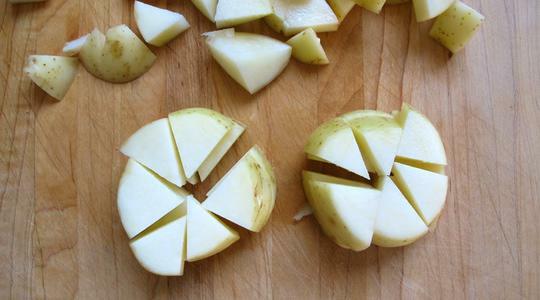 Then stack a few slices and cut them into 6 to 8 triangles like a pizza; repeat. Place this cutting board next to your pot on the stove. 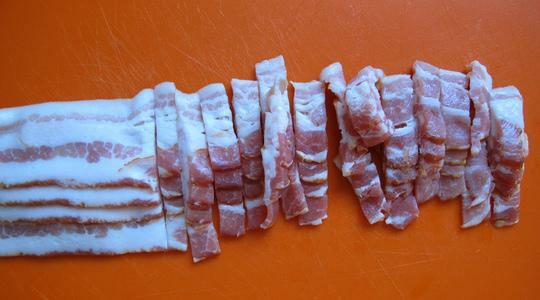 On a separate small cutting board, cut the bacon crosswise into ½-inch wide pieces. Turn the heat under your pot to medium. Add the bacon and cook, stirring often with a wooden spoon, until crisp, 6 to 8 minutes. While the bacon cooks, measure the milk. 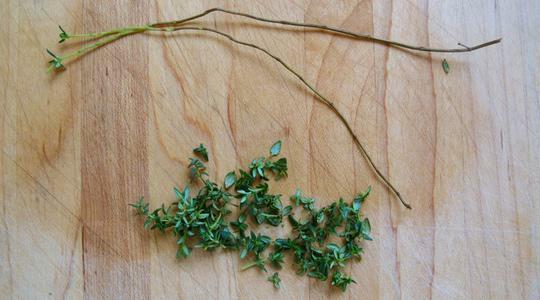 Wash the thyme and pull leaves from their sprigs. Once the bacon is cooked, remove pot from heat. 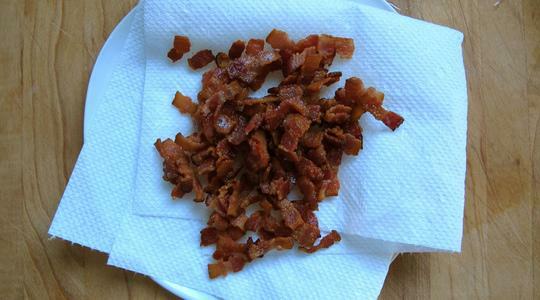 Using tongs, take out the bacon and place on a paper towel-lined plate, leaving the drippings in the pot (you should have about 2 tablespoons of drippings- you can just eyeball this). Return the pot to medium-high heat. 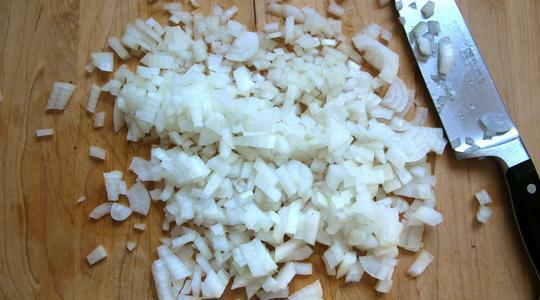 Add the onion and cook, stirring often, until it begins to soften, 4 to 5 minutes. Stir in the flour and cook 1 minute then add the milk, scraping the bottom of the pan as you slowly pour. Add the potatoes, corn, thyme, salt, black pepper (about 12 turns on pepper mill), and cayenne pepper. Increase heat to high and bring to a boil. Lower the heat to medium-low and simmer (low boil), stirring occasionally, until the potatoes are tender, 18 to 20 minutes. 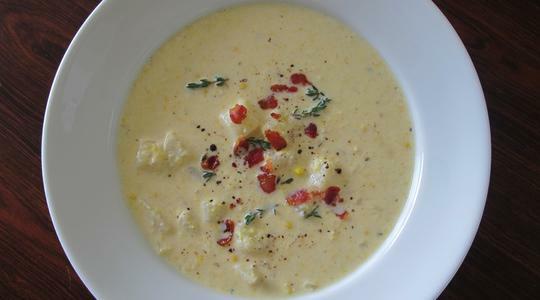 If you like a creamier soup, puree about half of the soup in a blender or use an immersion blender to get the consistency you like. Taste for salt, you may want to add a little more. Stir in the bacon and serve.